These illustrations were created using Adobe PhotoShop, and were used in a CBT course developed by Asymetrix Learning Systems for Ford Credit. As a production assistant on the project, I often had to search our stock image resources for things that the instructional designers had called for in the storyboards, but that we just didn't have. One such example was a recreational vehicle. 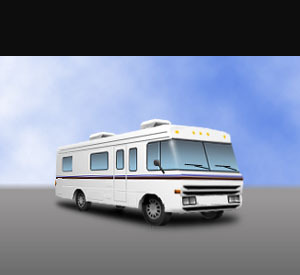 After much fruitless searching, I realized that if there was going to be a picture of an RV in the course, I would have to make it myself. What I came up with was a method of making near-3D-quality illustrations using the "perspective" and "layers" features of PhotoShop, treating the layers as "planes" in 3D space. When I handed the finished RV over to the project's lead designer, she asked me "Where did you get that cool RV?" When I told her I made it myself, she immediately wanted to know how it was done, and soon everyone in the art department was talking about my "Winnebago technique". 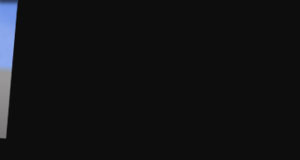 This proved to be very useful for creating 3D-like images where only one view was required, since it was faster than modeling and rendering the object in 3D Studio. 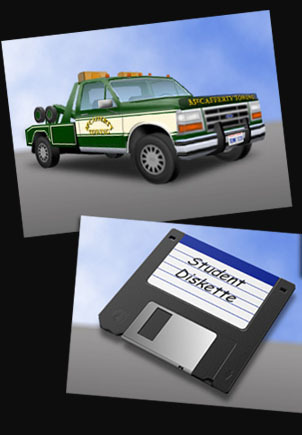 The towtruck and the floppy disk are other examples of objects created using the same technique.